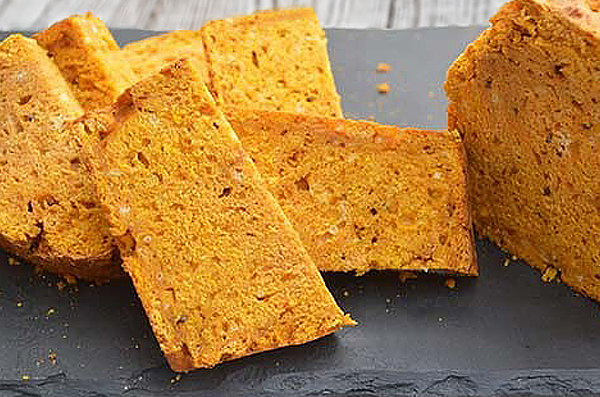 Cornbread is a great choice of side dish for almost any savoury meal. Follow this recipe and you will soon understand why. Made easily using a Panasonic bread maker). Crack your eggs into a bowl, and add the milk and lemon juice. Take your whisk to these ingredients and, once they’ve had a good mix, pour into the pan of your bread maker. Pour the remaining ingredients on top of your existing mix, and start your breadmaker on a Dough cycle. Leave the machine for around five minutes, then lift the lid and take a flat implement to the sides to avoid sticking and ensure the contents are nice and smooth. Never use your fingers for this – it’s what a spatula is for. You should probably do this twice, to be on the safe side. Return the pan to the bread machine, and this time set the device to bake (or extrabake depending on the make of your machine). This should take less than an hour, but feel free to keep an eye on the loaf within; if it has risen sufficiently and is smooth to the touch, it may be ready to come out. Leave the cornbread on a cooling rack once it has completed its cycle, chop up into squares or slices that will fit onto a side plate, and serve to your hungry diners!